Scattering amplitudes have played a central role in quantum field theory since its inception. Recent years have seen a remarkable advance in our understanding and in our ability to compute scattering amplitudes, both for theoretical and phenomenological purposes. 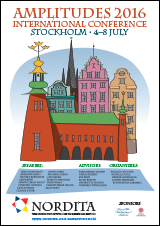 At the peak of the Nordic summer, Nordita and Stockholm will serve as hosts for the international conference Amplitudes 2016. The conference is devoted to exciting developments in the field of scattering amplitudes and related subjects. This includes, but is not limited to: amplitudes in gauge, gravity, and string theories, AdS/CFT and integrability, integrand structure of SYM and supergravity, IR and UV behavior, mathematics of polylogarithms and integrals, Grassmannians and twistor string approaches, symmetries and soft theorems, and connections to LHC phenomenology. F2 lecture hall on the KTH campus, 15 min walk from Nordita, in the northern part of central Stockholm. Reception at Berns Salonger on Monday July 4, 7pm. The conference is supported through funding from Nordita, Uppsala University, Knut and Alice Wallenberg Foundation and the Wenner-Gren Foundations.